October is Melissa & Doug Month! Fundraiser for rare diseases 2018, starting February: Thursday the 22nd through Wednesday the 28th! For more information, visit this Site! Or, click here to follow the event on Facebook! A New Leaf will be at the Marshall’s Bridal Show on January 22nd, 2017 at the Center of SMSU. The event takes place from 11:30 to 2:00pm. Please click on the links below to see our specials! Feb 12th Canby Schools will be closed; therefore, we will deliver school orders on Thursday Feb 11th. 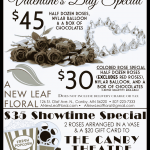 We are excited to serve you at A New Leaf Floral in Canby, MN this Valentine’s Day! We have multiple specials available this year! $40 – Half a dozen roses (red and other colors), mylar balloon, and a box of Hersey Kisses. $25- Half dozen roses (NO RED), mylar balloon, and a box of Hersey Kisses. This special is only while supplies last. $34.95- Showtime Special. 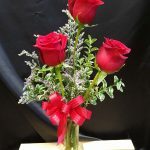 Two roses arranged in a vase and a $20 gift certificate to the Canby Theater. $34.95- Guns and Roses Special. Two roses arranged in a vase and a $20 gift certificate to Kjergaard Sports. Contact Us to place your order. We appreciate you and your business! Thank You!